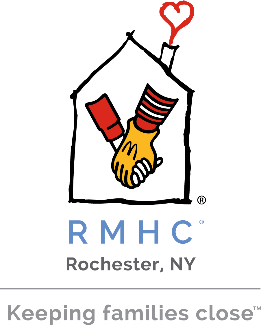 Thank you for your interest in preparing a meal for our RMHC families. We provide lodging and support to more than 800 families each year, and meals are an important part of that. There is a different atmosphere in the House when meals are provided. More people gather and become support for one another. It's nice for people to come "home" after a long day at the hospital, smell comforting aroma of a home-cooked meal and feel taken care of. If you have any questions about our Make a Meal program please call 585-442-5437 ext 0. We ask that there be no more than 8 people in your group to prepare a meal. Everyone in the group should be over 16 unless accompanied by an adult to provide direct supervision. Each adult cannot supervise more than two children. If you have a larger group or participants under the age of 16 please call the Assistant House Manager at 585-442-5437 ext 0 to find out about our Snack Bag program. Breakfast is typically served between 8:00-8:30am, dinner is served between 6:00-6:30pm. You are only expected to stay until you're finished preparing the meal, setting it out and cleaning up.